This English Bible History Article & Timeline is &COPY;2002 by author & editor: John L. Jeffcoat III. Special thanks is also given to Dr. Craig H. Lampe for his valuable contributions to the text. This page has been freely reproduced in whole, electronically, with credit and appreciation given to www.GreatSite.com. The fascinating story of how we got the Bible in its present form actually starts thousands of years ago, as briefly outlined in our Timeline of Bible Translation History. As a background study, we recommend that you first review our discussion of the Pre-Reformation History of the Bible from 1,400 B.C. to 1,400 A.D., which covers the transmission of the scripture through the original languages of Hebrew and Greek, and the 1,000 years of the Dark & Middle Ages when the Word was trapped in only Latin. Our starting point in this discussion of Bible history, however, is the advent of the scripture in the English language with the Morning Star of the Reformation, John Wycliffe. The first hand-written English language Bible manuscripts were produced in the 1380's AD by John Wycliffe, an Oxford professor, scholar, and theologian. Wycliffe, (also spelled Wycliff & Wyclif), was well-known throughout Europe for his opposition to the teaching of the organized Church, which he believed to be contrary to the Bible. With the help of his followers, called the Lollards, and his assistant Purvey, and many other faithful scribes, Wycliffe produced dozens of English language manuscript copies of the scriptures. They were translated out of the Latin Vulgate, which was the only source text available to Wycliffe. The Pope was so infuriated by his teachings and his translation of the Bible into English, that 44 years after Wycliffe had died, he ordered the bones to be dug-up, crushed, and scattered in the river! One of Wycliffes followers, John Hus, actively promoted Wycliffes ideas: that people should be permitted to read the Bible in their own language, and they should oppose the tyranny of the Roman church that threatened anyone possessing a non-Latin Bible with execution. Hus was burned at the stake in 1415, with Wycliffes manuscript Bibles used as kindling for the fire. The last words of John Hus were that, in 100 years, God will raise up a man whose calls for reform cannot be suppressed. Almost exactly 100 years later, in 1517, Martin Luther nailed his famous 95 Theses of Contention (a list of 95 issues of heretical theology and crimes of the Roman Catholic Church) into the church door at Wittenberg. The prophecy of Hus had come true! Martin Luther went on to be the first person to translate and publish the Bible in the commonly-spoken dialect of the German people; a translation more appealing than previous German Biblical translations. Foxes Book of Martyrs records that in that same year, 1517, seven people were burned at the stake by the Roman Catholic Church for the crime of teaching their children to say the Lords Prayer in English rather than Latin. Johann Gutenberg invented the printing press in the 1450's, and the first book to ever be printed was a Latin language Bible, printed in Mainz, Germany. Gutenbergs Bibles were surprisingly beautiful, as each leaf Gutenberg printed was later colorfully hand-illuminated. Born as Johann Gensfleisch (John Gooseflesh), he preferred to be known as Johann Gutenberg (John Beautiful Mountain). Ironically, though he had created what many believe to be the most important invention in history, Gutenberg was a victim of unscrupulous business associates who took control of his business and left him in poverty. Nevertheless, the invention of the movable-type printing press meant that Bibles and books could finally be effectively produced in large quantities in a short period of time. This was essential to the success of the Reformation. In the 1490s another Oxford professor, and the personal physician to King Henry the 7th and 8th, Thomas Linacre, decided to learn Greek. After reading the Gospels in Greek, and comparing it to the Latin Vulgate, he wrote in his diary, Either this (the original Greek) is not the Gospel& or we are not Christians. The Latin had become so corrupt that it no longer even preserved the message of the Gospel& yet the Church still threatened to kill anyone who read the scripture in any language other than Latin& though Latin was not an original language of the scriptures. In 1496, John Colet, another Oxford professor and the son of the Mayor of London, started reading the New Testament in Greek and translating it into English for his students at Oxford, and later for the public at Saint Pauls Cathedral in London. The people were so hungry to hear the Word of God in a language they could understand, that within six months there were 20,000 people packed in the church and at least that many outside trying to get in! (Sadly, while the enormous and beautiful Saint Pauls Cathedral remains the main church in London today, as of 2003, typical Sunday morning worship attendance is only around 200 people& and most of them are tourists). Fortunately for Colet, he was a powerful man with friends in high places, so he amazingly managed to avoid execution. In considering the experiences of Linacre and Colet, the great scholar Erasmus was so moved to correct the corrupt Latin Vulgate, that in 1516, with the help of printer John Froben, he published a Greek-Latin Parallel New Testament. The Latin part was not the corrupt Vulgate, but his own fresh rendering of the text from the more accurate and reliable Greek, which he had managed to collate from a half-dozen partial old Greek New Testament manuscripts he had acquired. This milestone was the first non-Latin Vulgate text of the scripture to be produced in a millennium& and the first ever to come off a printing press. The 1516 Greek-Latin New Testament of Erasmus further focused attention on just how corrupt and inaccurate the Latin Vulgate had become, and how important it was to go back and use the original Greek (New Testament) and original Hebrew (Old Testament) languages to maintain accuracy& and to translate them faithfully into the languages of the common people, whether that be English, German, or any other tongue. No sympathy for this illegal activity was to be found from Rome& even as the words of Pope Leo X's declaration that "the fable of Christ was quite profitable to him" continued through the years to infuriate the people of God. William Tyndale was the Captain of the Army of Reformers, and was their spiritual leader. Tyndale holds the distinction of being the first man to ever print the New Testament in the English language. Tyndale was a true scholar and a genius, so fluent in eight languages that it was said one would think any one of them to be his native tongue. He is frequently referred to as the Architect of the English Language, (even more so than William Shakespeare) as so many of the phrases Tyndale coined are still in our language today. Martin Luther had a small head-start on Tyndale, as Luther declared his intolerance for the Roman Churchs corruption on Halloween in 1517, by nailing his 95 Theses of Contention to the Wittenberg Church door. Luther, who would be exiled in the months following the Diet of Worms Council in 1521 that was designed to martyr him, would translate the New Testament into German for the first time from the 1516 Greek-Latin New Testament of Erasmus, and publish it in September of 1522. Luther also published a German Pentateuch in 1523, and another edition of the German New Testament in 1529. In the 1530s he would go on to publish the entire Bible in German. Myles Coverdale and John Thomas Matthew Rogers had remained loyal disciples the last six years of Tyndale's life, and they carried the English Bible project forward and even accelerated it. Coverdale finished translating the Old Testament, and in 1535 he printed the first complete Bible in the English language, making use of Luther's German text and the Latin as sources. 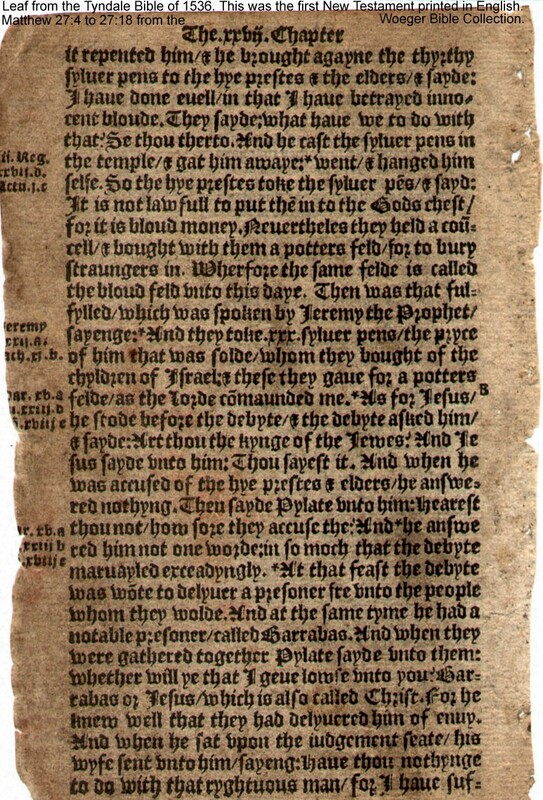 Thus, the first complete English Bible was printed on October 4, 1535, and is known as the Coverdale Bible. It was not that King Henry VIII had a change of conscience regarding publishing the Bible in English. His motives were more sinister& but the Lord sometimes uses the evil intentions of men to bring about His glory. King Henry VIII had in fact, requested that the Pope permit him to divorce his wife and marry his mistress. The Pope refused. King Henry responded by marrying his mistress anyway, (later having two of his many wives executed), and thumbing his nose at the Pope by renouncing Roman Catholicism, taking England out from under Rome's religious control, and declaring himself as the reigning head of State to also be the new head of the Church. This new branch of the Christian Church, neither Roman Catholic nor truly Protestant, became known as the Anglican Church or the Church of England. King Henry acted essentially as its Pope. His first act was to further defy the wishes of Rome by funding the printing of the scriptures in English& the first legal English Bible& just for spite. The ebb and flow of freedom continued through the 1540's...and into the 1550's. After King Henry VIII, King Edward VI took the throne, and after his death, the reign of Queen Bloody Mary was the next obstacle to the printing of the Bible in English. She was possessed in her quest to return England to the Roman Church. In 1555, John "Thomas Matthew" Rogers and Thomas Cranmer were both burned at the stake. Mary went on to burn reformers at the stake by the hundreds for the "crime" of being a Protestant. This era was known as the Marian Exile, and the refugees fled from England with little hope of ever seeing their home or friends again. In the 1550's, the Church at Geneva, Switzerland, was very sympathetic to the reformer refugees and was one of only a few safe havens for a desperate people. Many of them met in Geneva, led by Myles Coverdale and John Foxe (publisher of the famous Foxe's Book of Martyrs, which is to this day the only exhaustive reference work on the persecution and martyrdom of Early Christians and Protestants from the first century up to the mid-16th century), as well as Thomas Sampson and William Whittingham. There, with the protection of the great theologian John Calvin, Calvins Institutes of the Christian Religion and John Knox, the great Reformer of the Scottish Church, the Church of Geneva determined to produce a Bible that would educate their families while they continued in exile. John Calvin, the author of the most famous theological book ever published, Calvins Institutes of the Christian Religion. The New Testament was completed in 1557, and the complete Bible was first published in 1560. It became known as the Geneva Bible. Due to a passage in Genesis describing the clothing that God fashioned for Adam and Eve upon expulsion from the Garden of Eden as "Breeches" (an antiquated form of "Britches"), some people referred to the Geneva Bible as the Breeches Bible. John Knox, is known as the great Reformer of the Scottish Church. The Geneva Bible was the first Bible to add numbered verses to the chapters, so that referencing specific passages would be easier. Every chapter was also accompanied by extensive marginal notes and references so thorough and complete that the Geneva Bible is also considered the first English "Study Bible". William Shakespeare quotes hundreds of times in his plays from the Geneva translation of the Bible. The Geneva Bible became the Bible of choice for over 100 years of English speaking Christians. Between 1560 and 1644 at least 144 editions of this Bible were published. Examination of the 1611 King James Bible shows clearly that its translators were influenced much more by the Geneva Bible, than by any other source. The Geneva Bible itself retains over 90% of William Tyndale's original English translation. The Geneva in fact, remained more popular than the King James Version until decades after its original release in 1611! The Geneva holds the honor of being the first Bible taken to America, and the Bible of the Puritans and Pilgrims. It is truly the Bible of the Protestant Reformation. Strangely, the famous Geneva Bible has been out-of-print since 1644, so the only way to obtain one is to either purchase an original printing of the Geneva Bible, or a less costly facsimile reproduction of the original 1560 Geneva Bible. With the end of Queen Mary's bloody reign, the reformers could safely return to England. The Anglican Church, now under Queen Elizabeth I, reluctantly tolerated the printing and distribution of Geneva version Bibles in England. The marginal notes, which were vehemently against the institutional Church of the day, did not rest well with the rulers of the day. Another version, one with a less inflammatory tone was desired, and the copies of the Great Bible were getting to be decades old. In 1568, a revision of the Great Bible known as the Bishop's Bible was introduced. Despite 19 editions being printed between 1568 and 1606, this Bible, referred to as the rough draft of the King James Version, never gained much of a foothold of popularity among the people. The Geneva may have simply been too much to compete with. The Anglican Churchs King James Bible took decades to overcome the more popular Protestant Churchs Geneva Bible. One of the greatest ironies of history, is that many Protestant Christian churches today embrace the King James Bible exclusively as the only legitimate English language translation& yet it is not even a Protestant translation! It was printed to compete with the Protestant Geneva Bible, by authorities who throughout most of history were hostile to Protestants& and killed them. While many Protestants are quick to assign the full blame of persecution to the Roman Catholic Church, it should be noted that even after England broke from Roman Catholicism in the 1500s, the Church of England (The Anglican Church) continued to persecute Protestants throughout the 1600s. One famous example of this is John Bunyan, who while in prison for the crime of preaching the Gospel, wrote one of Christian historys greatest books, Pilgrims Progress. Throughout the 1600s, as the Puritans and the Pilgrims fled the religious persecution of England to cross the Atlantic and start a new free nation in America, they took with them their precious Geneva Bible, and rejected the Kings Bible. America was founded upon the Geneva Bible, not the King James Bible. Protestants today are largely unaware of their own history, and unaware of the Geneva Bible (which is textually 95% the same as the King James Version, but 50 years older than the King James Version, and not influenced by the Roman Catholic Rheims New Testament that the King James translators admittedly took into consideration). Nevertheless, the King James Bible turned out to be an excellent and accurate translation, and it became the most printed book in the history of the world, and the only book with one billion copies in print. In fact, for over 250 years...until the appearance of the English Revised Version of 1881-1885...the King James Version reigned without much of a rival. One little-known fact, is that for the past 200 years, all King James Bibles published in America are actually the 1769 Baskerville spelling and wording revision of the 1611. The original 1611 preface is deceivingly included by the publishers, and no mention of the fact that it is really the 1769 version is to be found, because that might hurt sales. The only way to obtain a true, unaltered, 1611 version is to either purchase an original pre-1769 printing of the King James Bible, or a less costly facsimile reproduction of the original 1611 King James Bible. Although the first Bible printed in America was done in the native Algonquin Indian Language by John Eliot in 1663; the first English language Bible to be printed in America by Robert Aitken in 1782 was a King James Version. Robert Aitkens 1782 Bible was also the only Bible ever authorized by the United States Congress. He was commended by President George Washington for providing Americans with Bibles during the embargo of imported English goods due to the Revolutionary War. In 1808, Roberts daughter, Jane Aitken, would become the first woman to ever print a Bible& and to do so in America, of course. In 1791, Isaac Collins vastly improved upon the quality and size of the typesetting of American Bibles and produced the first "Family Bible" printed in America... also a King James Version. Also in 1791, Isaiah Thomas published the first Illustrated Bible printed in America...in the King James Version. For more information on the earliest Bibles printed in America from the 1600s through the early 1800s, you may wish to review our more detailed discussion of The Bibles of Colonial America. While Noah Webster, just a few years after producing his famous Dictionary of the English Language, would produce his own modern translation of the English Bible in 1833; the public remained too loyal to the King James Version for Websters version to have much impact. It was not really until the 1880s that Englands own planned replacement for their King James Bible, the English Revised Version(E.R.V.) would become the first English language Bible to gain popular acceptance as a post-King James Version modern-English Bible. The widespread popularity of this modern-English translation brought with it another curious characteristic: the absence of the 14 Apocryphal books. Up until the 1880s every Protestant Bible (not just Catholic Bibles) had 80 books, not 66! The inter-testamental books written hundreds of years before Christ called The Apocrypha were part of virtually every printing of the Tyndale-Matthews Bible, the Great Bible, the Bishops Bible, the Protestant Geneva Bible, and the King James Bible until their removal in the 1880s! The original 1611 King James contained the Apocrypha, and King James threatened anyone who dared to print the Bible without the Apocrypha with heavy fines and a year in jail. Only for the last 120 years has the Protestant Church rejected these books, and removed them from their Bibles. This has left most modern-day Christians believing the popular myth that there is something Roman Catholic about the Apocrypha. There is, however, no truth in that myth, and no widely-accepted reason for the removal of the Apocrypha in the 1880s has ever been officially issued by a mainline Protestant denomination. The Americans responded to Englands E.R.V. Bible by publishing the nearly-identical American Standard Version (A.S.V.) in 1901. It was also widely-accepted and embraced by churches throughout America for many decades as the leading modern-English version of the Bible. In the 1971, it was again revised and called New American Standard Version Bible (often referred to as the N.A.S.V. or N.A.S.B. or N.A.S.). This New American Standard Bible is considered by nearly all evangelical Christian scholars and translators today, to be the most accurate, word-for-word translation of the original Greek and Hebrew scriptures into the modern English language that has ever been produced. It remains the most popular version among theologians, professors, scholars, and seminary students today. Some, however, have taken issue with it because it is so direct and literal a translation (focused on accuracy), that it does not flow as easily in conversational English. For this reason, in 1973, the New International Version (N.I.V.) was produced, which was offered as a dynamic equivalent translation into modern English. The N.I.V. was designed not for word-for-word accuracy, but rather, for phrase-for-phrase accuracy, and ease of reading even at a Junior High-School reading level. It was meant to appeal to a broader (and in some instances less-educated) cross-section of the general public. Critics of the N.I.V. often jokingly refer to it as the Nearly Inspired Version, but that has not stopped it from becoming the best-selling modern-English translation of the Bible ever published. In 1982, Thomas Nelson Publishers produced what they called the New King James Version. Their original intent was to keep the basic wording of the King James to appeal to King James Version loyalists, while only changing the most obscure words and the Elizabethan thee, thy, thou pronouns. This was an interesting marketing ploy, however, upon discovering that this was not enough of a change for them to be able to legally copyright the result, they had to make more significant revisions, which defeated their purpose in the first place. It was never taken seriously by scholars, but it has enjoyed some degree of public acceptance, simply because of its clever New King James Version marketing name. In 2002, a major attempt was made to bridge the gap between the simple readability of the N.I.V., and the extremely precise accuracy of the N.A.S.B. This translation is called the English Standard Version (E.S.V.) and is rapidly gaining popularity for its readability and accuracy. The 21st Century will certainly continue to bring new translations of Gods Word in the modern English language. As Christians, we must be very careful to make intelligent and informed decisions about what translations of the Bible we choose to read. On the liberal extreme, we have people who would give us heretical new translations that attempt to change Gods Word to make it politically correct. One example of this, which has made headlines recently is the Todays New International Version (T.N.I.V.) which seeks to remove all gender-specific references in the Bible whenever possible! Not all new translations are good& and some are very bad. But equally dangerous, is the other extreme& of blindly rejecting ANY English translation that was produced in the four centuries that have come after the 1611 King James. We must remember that the main purpose of the Protestant Reformation was to get the Bible out of the chains of being trapped in an ancient language that few could understand, and into the modern, spoken, conversational language of the present day. William Tyndale fought and died for the right to print the Bible in the common, spoken, modern English tongue of his day& as he boldly told one official who criticized his efforts, If God spare my life, I will see to it that the boy who drives the plowshare knows more of the scripture than you, Sir! Will we now go backwards, and seek to imprison Gods Word once again exclusively in ancient translations? Clearly it is not Gods will that we over-react to SOME of the bad modern translations, by rejecting ALL new translations and throwing the baby out with the bathwater. The Word of God is unchanging from generation to generation, but language is a dynamic and ever-changing form of communication. We therefore have a responsibility before God as Christians to make sure that each generation has a modern translation that they can easily understand, yet that does not sacrifice accuracy in any way. Lets be ever mindful that we are not called to worship the Bible. That is called idolatry. We are called to worship the God who gave us the Bible, and who preserved it through the centuries of people who sought to destroy it. Anglo-Saxon Proto-English Manuscripts (995 AD): God lufode middan-eard swa, dat he seade his an-cennedan sunu, dat nan ne forweorde de on hine gely ac habbe dat ece lif."